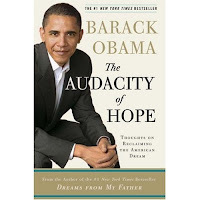 I finished reading last Friday Barack Obama's The Audacity of Hope. Again I read this via audio book in my car while commuting so I pushed through it somewhat fast. I don't really classify myself as a democrat or a republican so I don't find myself loving or hating Obama. I tend to believe in a more Libertarian or Capitalistic political approach so there were some things that I really didn't agree with in this book but on the other hand there were many elements to Obama's philosophy that I couldn't help but love. In this book Obama pretty much just skimmed over his beliefs on just about every possible subject while sporadically including thoughts and stories from his own childhood and adult life. It was very interesting to learn of the growth of Barack from relative anonymousness to political super stardom. I had never heard of him until last fall even. Mostly I found I loved his speaking ability and the quality of his voice and vocal inflections as he read. He seemed inspiring even when I didn't fully agree with what he had to say. Funny, but true. Honestly, I think he would be a fine president that I could support but for now I won't be voting for him, there are to many other candidates that I might find more attractive. If anyone wants to learn about Barack then this is the book / 5 CDs to to do it.